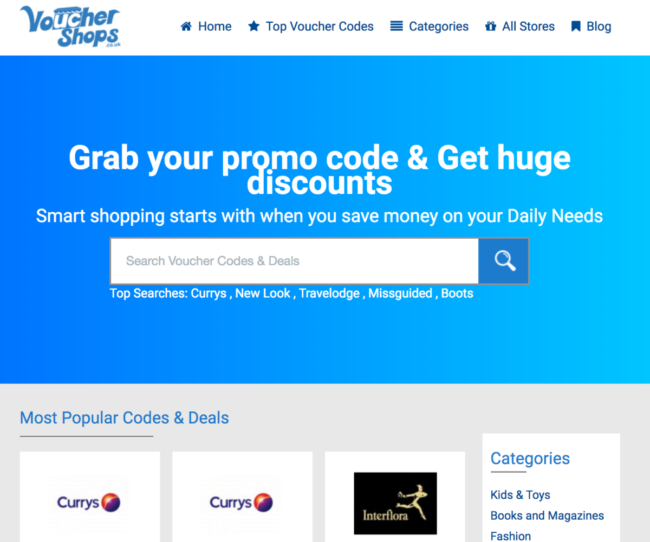 Vouchershops.co.uk is a leading, UK-based vouchers website offering a wide variety of promo codes and deals from big merchants such as Currys, Boots and National Express. There are amazing deals available for a wide variety of UK stores, making it easy to shop online at discounted prices. The home page features fresh and unique voucher codes and deals, offers from the most popular stores and a wide range of the most searched for categories. Vouchershops.co.uk is a good, UK vouchers website offering a great amount of deals and discounts for leading stores. The design is simple and straightforward and helps you find the latest vouchers and deals without making an effort. So shop smartly and save on hundreds of household items.